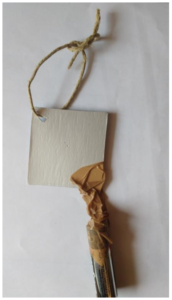 The hackAIR cardboard sensor is low-cost and easy to use. 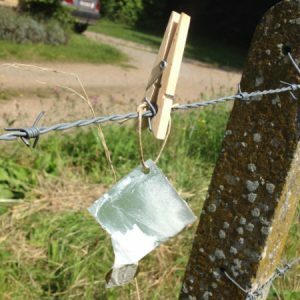 You expose the cardboard for 24 hours, and then analyse a macro-photograph of the jelly to calculate pollution levels in the hackAIR app. Cardboard offers a crude measurement. Estimates of air pollution by particulate matter are therefore only given at three levels: low, medium and high. A printable version of this tutorial is also available. Macro lenses can be found online. The Blips Micro, for example, is excellent and costs 13,90 EUR. 1. Cut open the drinks carton and fold it open. 2. Cut one or several square pieces of about 5×5 cm size. 3. Along the diagonal axis of the pieces and near the center, make two small dots with the tip of the pencil. 4. Along that same diagonal axis, bend the surface slightly outward. 5. Make a hole in the upper-right corner and tie a thread through it. 6. Do the same at the lower-left corner, and attach a small weight to it (a paper clip, coin, pen). 7. Use the butter knife to apply a small amount of petroleum jelly on the surface of the carton. Spread the jelly as evenly and smoothly as possible. 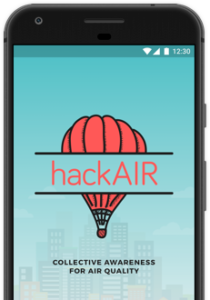 All you need is the hackAIR app on your phone. Place the sensor outside with the test surface facing windward, and sheltered from rain. Ensure that the sensor doesn’t touch anything. Expose the sensor for a full day (ideally 24 hours), then retrieve it. 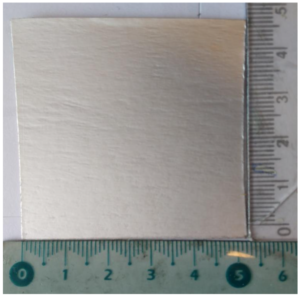 Cut out a 1x1cm area around the two dots in the middle and place it flat on a well-lit table. 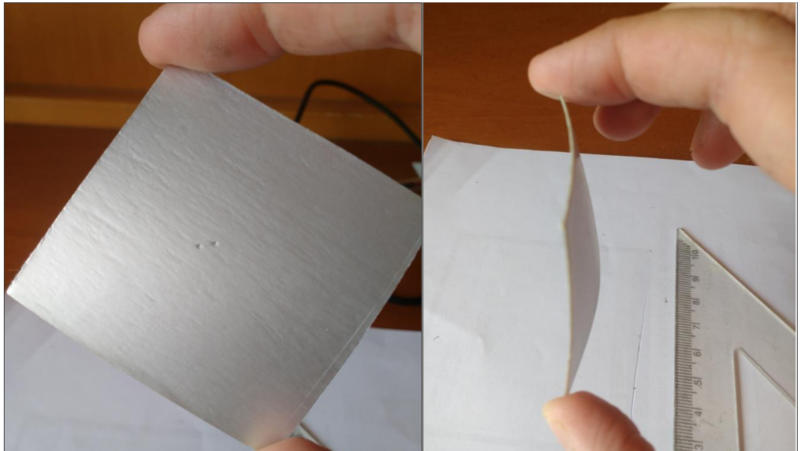 Be careful not to touch the surface of the cardboard sensor. Attach your macro lens (e.g. Blips micro) to your cell phone’s camera. Open the hackAIR app and go to Photo > Take a photo of your hackAIR cardboard sensor. 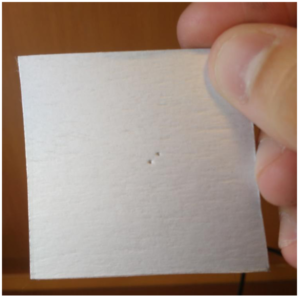 Locate the two dots on the test surface with your cellphone’s camera. Focus on one of the two dots until you can see the shape of the dot as clearly as possible through the camera. Take the picture and upload it to the hackAIR app. You will immediately receive an estimate of the air quality. If you run into problems or have questions, check out the hackAIR FAQ.